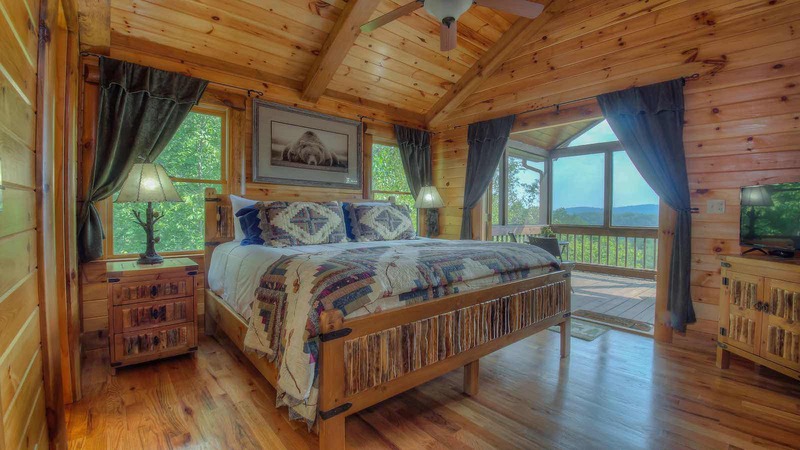 Chasing Dreams is a lovely mountain view cabin located in the Mountain Tops community in Blue Ridge, Georgia. 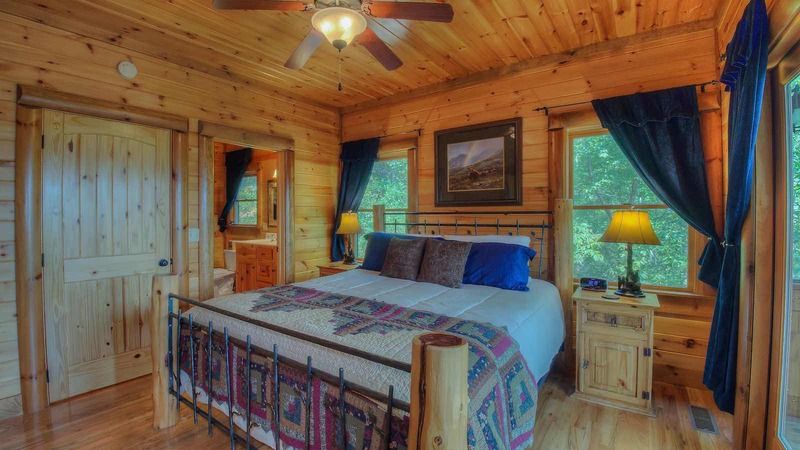 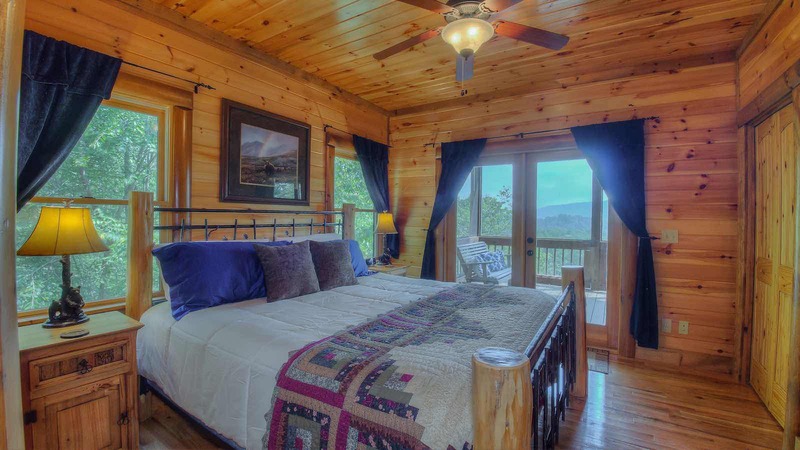 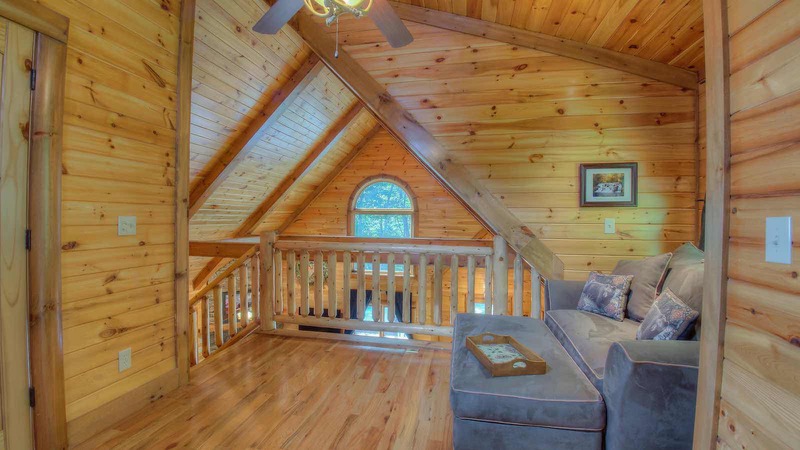 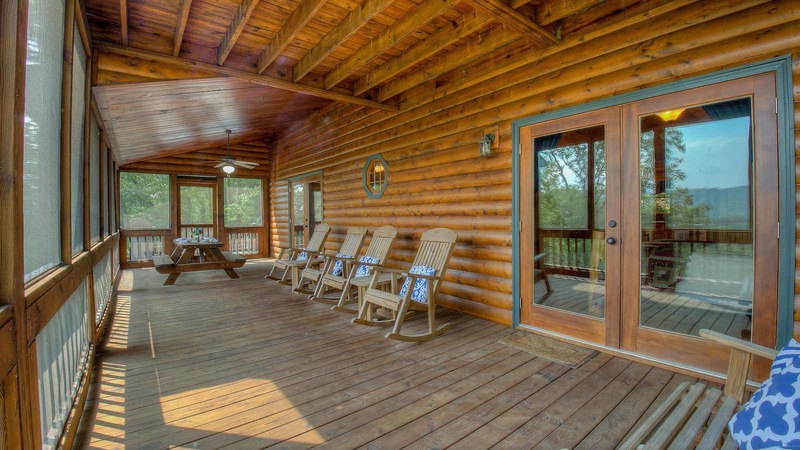 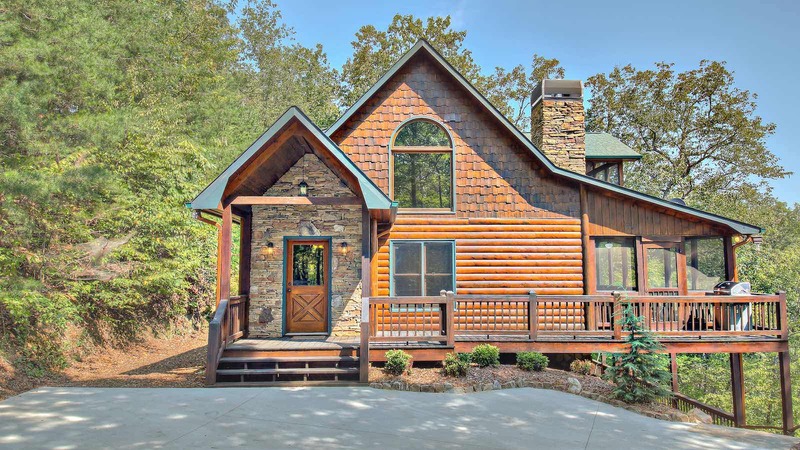 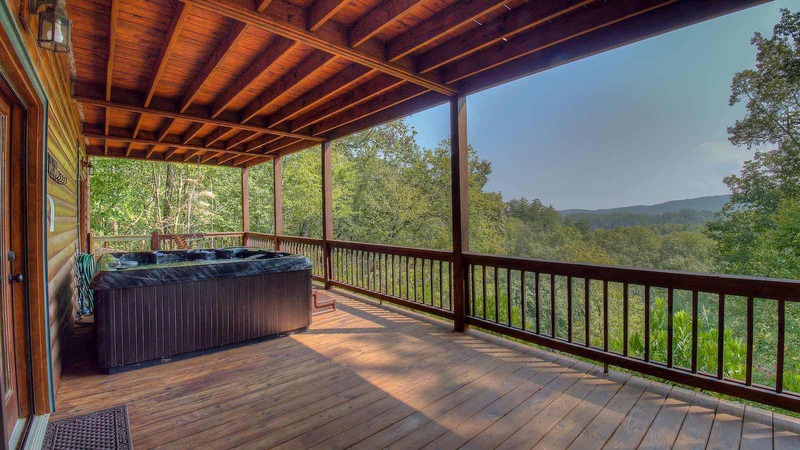 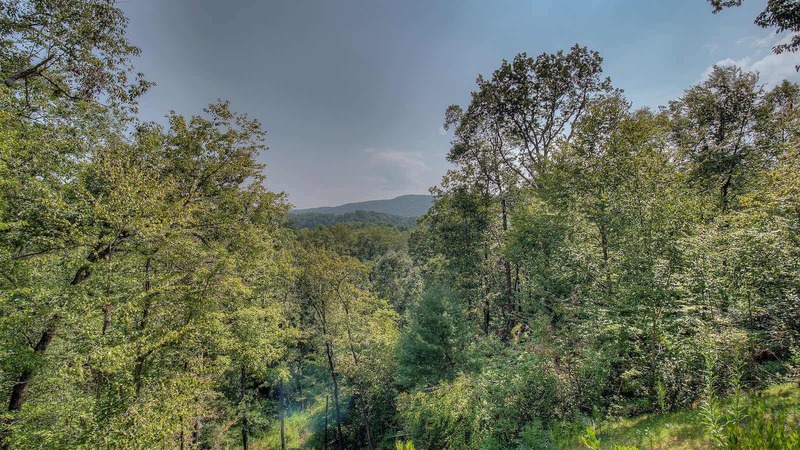 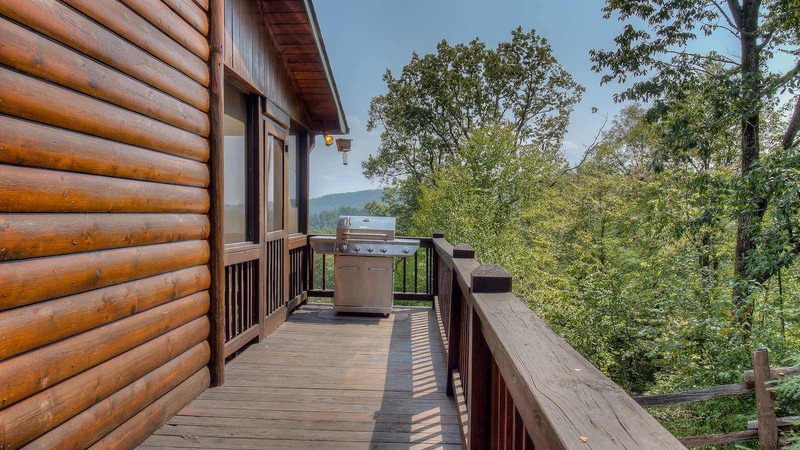 This cabin has 3 bedrooms, with three baths plus two levels of screened porches, gas grill, hot tub on lower level, pool table, AND it’s all on paved roads only 5 minutes from Downtown Blue Ridge! 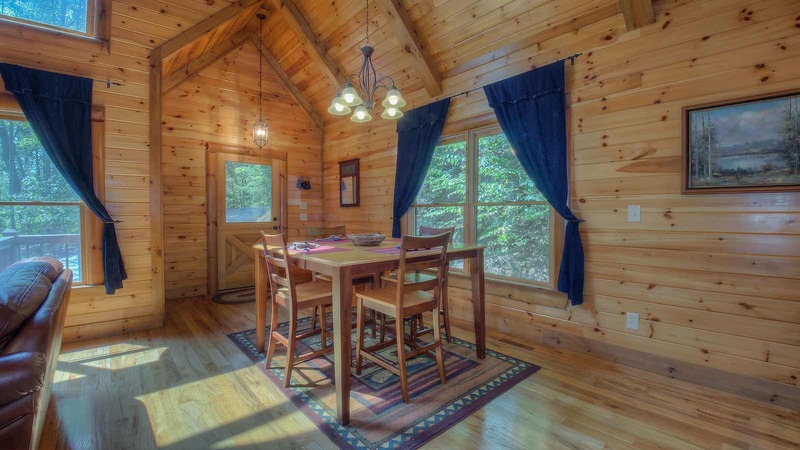 You'll access the cabin along a paved road, and find that it is fairly private even though it is in a community. 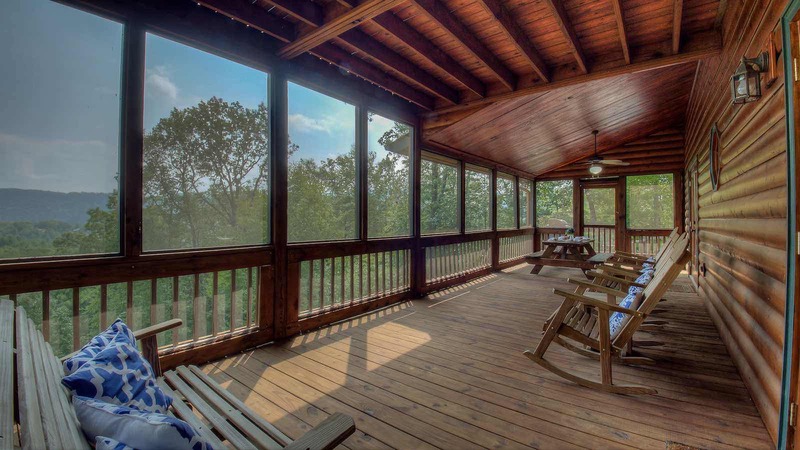 Chasing Dreams has a beautiful rocked entryway with a wrap-around deck, that is partially covered and screened. 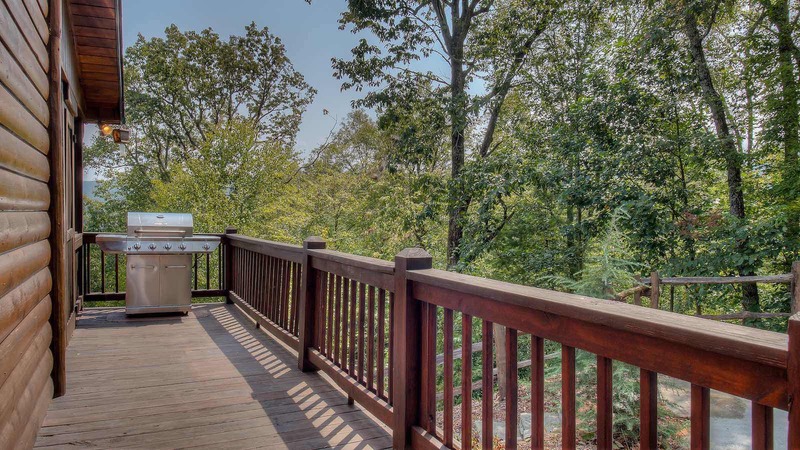 You'll find the gas grill on this main level deck, and it also has a large covered portion with seating and a picnic table. 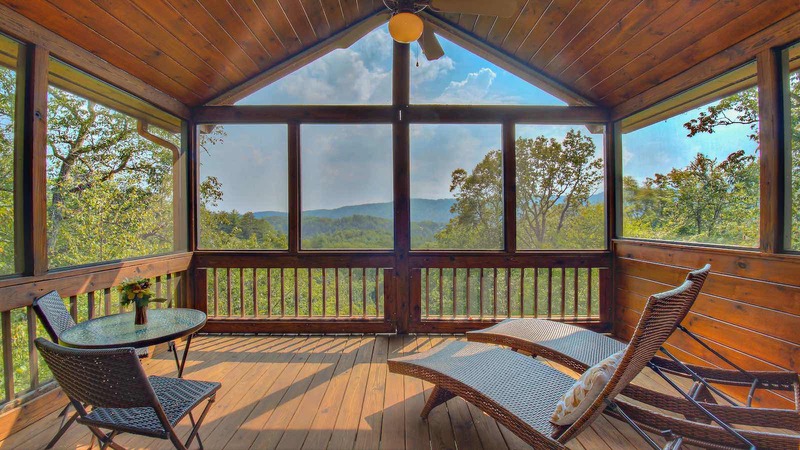 This covered portion of the deck is screened in, which is a wonderful added bonus when enjoying the mountain view while dining on this deck. 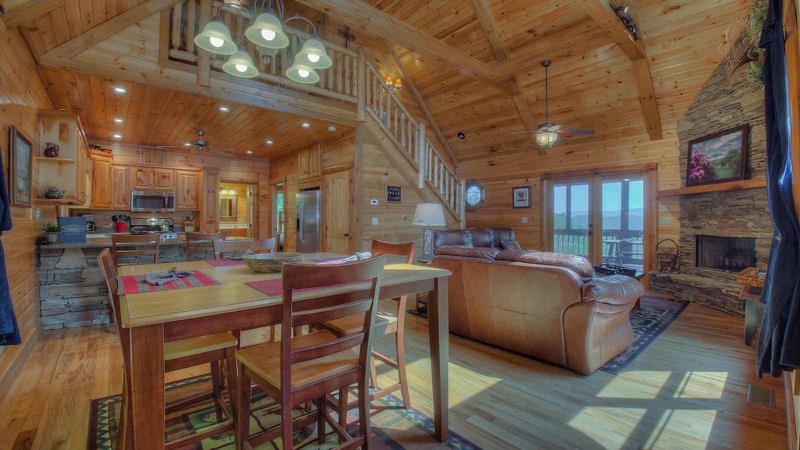 Inside the main level is the living room, kitchen, and dining area. 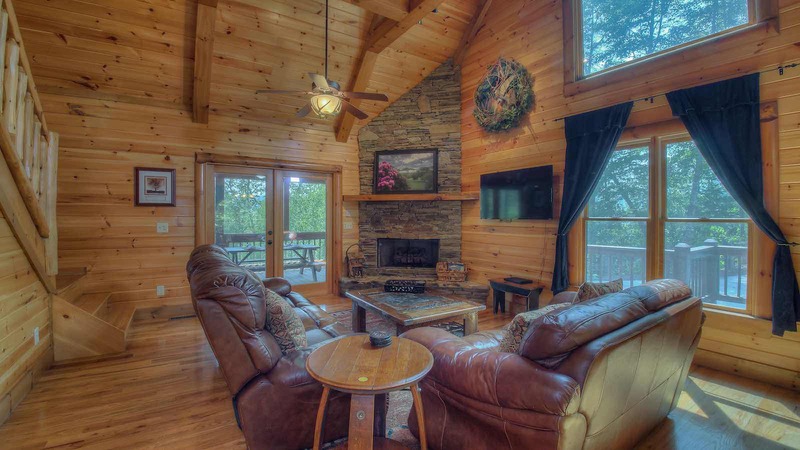 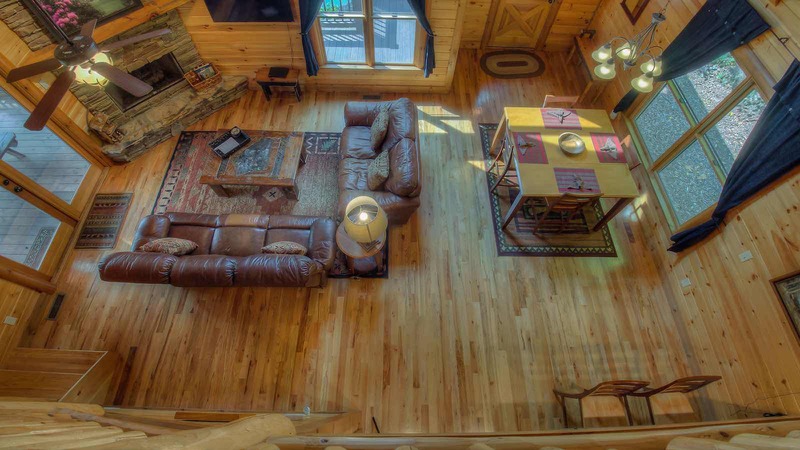 The living space has cozy leather sofas around the flat screen TV and stacked stone gas log fireplace. 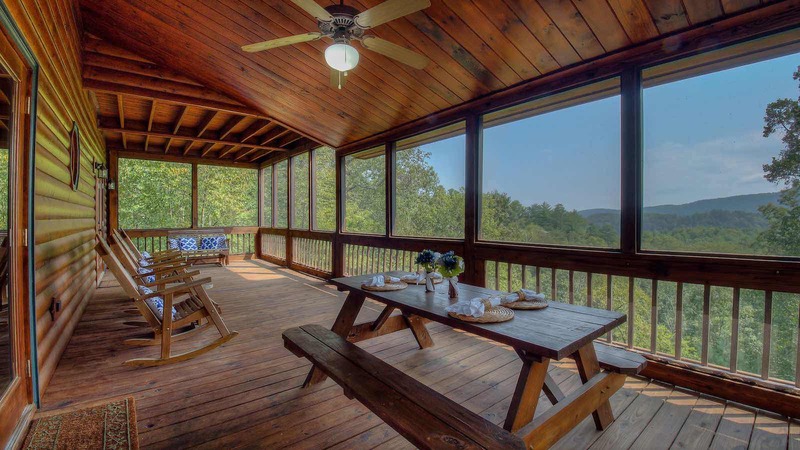 The dining table has seating for 4 guests, with seating at the kitchen's stacked stone bar for 2 more guests. 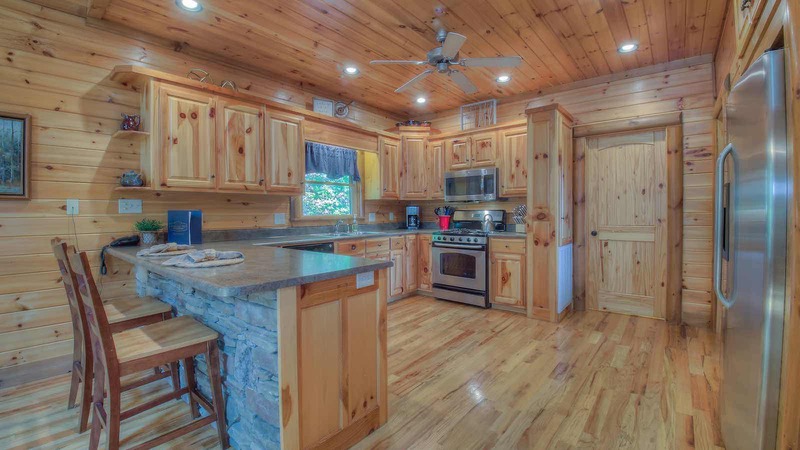 The kitchen offers stainless steel appliances and plenty of prep space for making meals in-cabin. 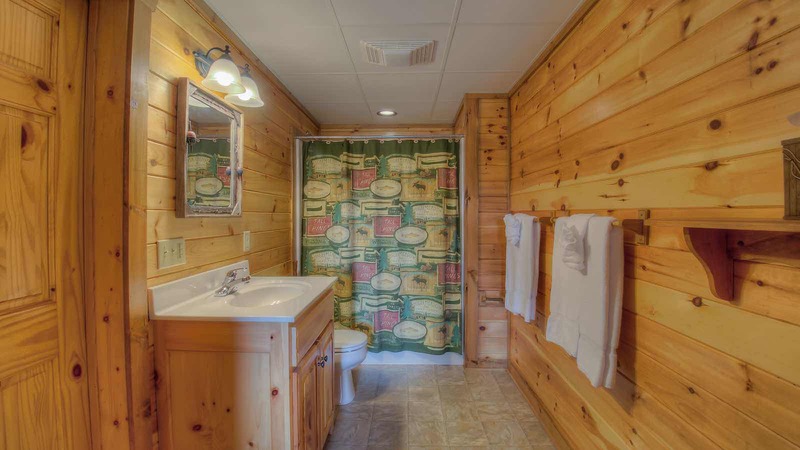 Around the corner of the kitchen is the main level bathroom and bedroom. 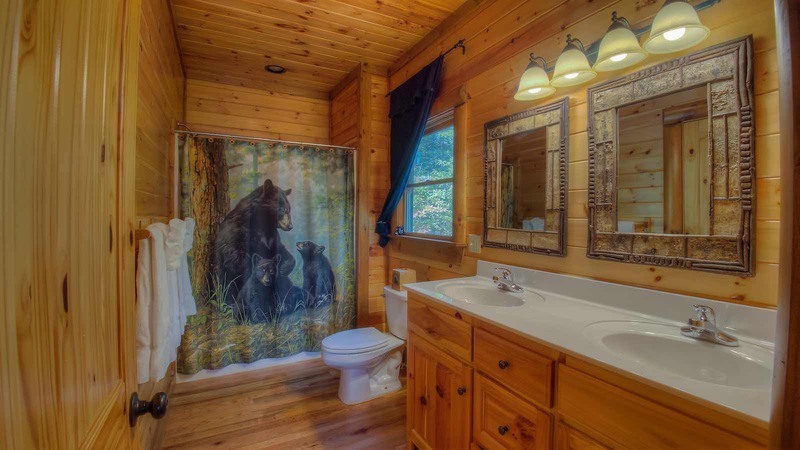 The bathroom has a double vanity along with a shower tub combo, and the bedroom offers a King size bed. 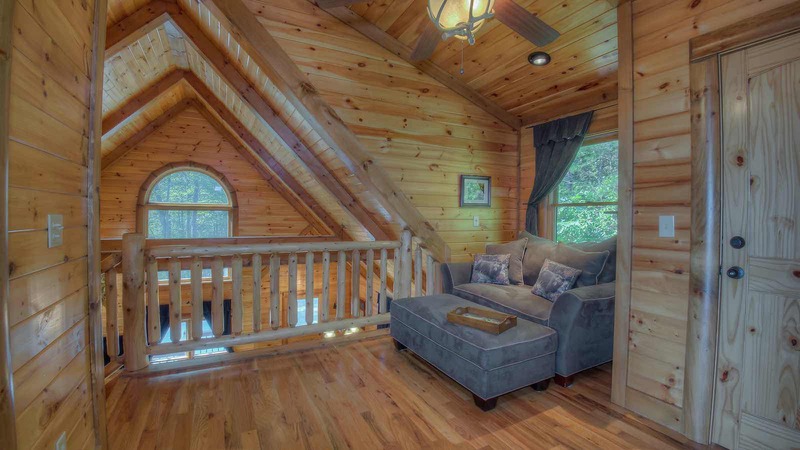 Up the stairs to the master bedroom, you'll first see a cozy reading loft at the top of the staircase. 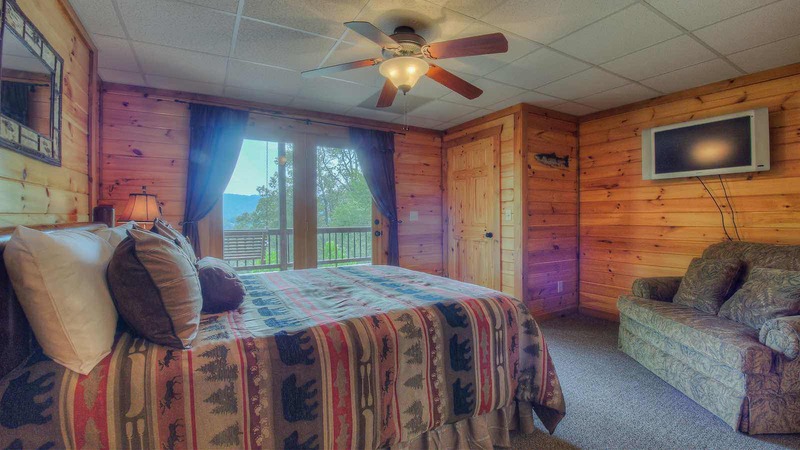 To your right, you'll find the master bedroom. 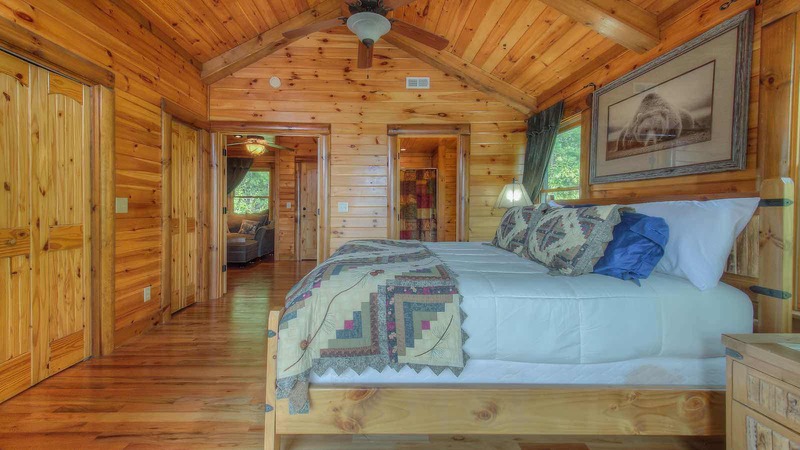 The master boasts a King size bed, flat screen TV, double vanity with a standard shower, and its own private screened balcony! 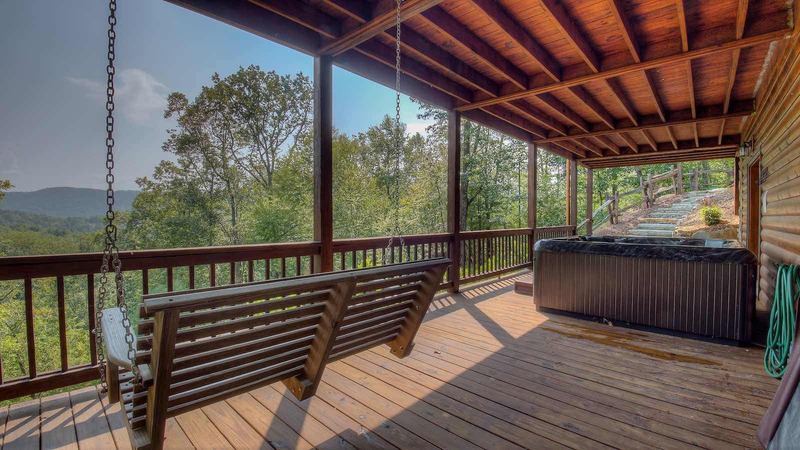 This balcony is perfect for relaxing with others, as it has two chaise lounges and a small table for two. 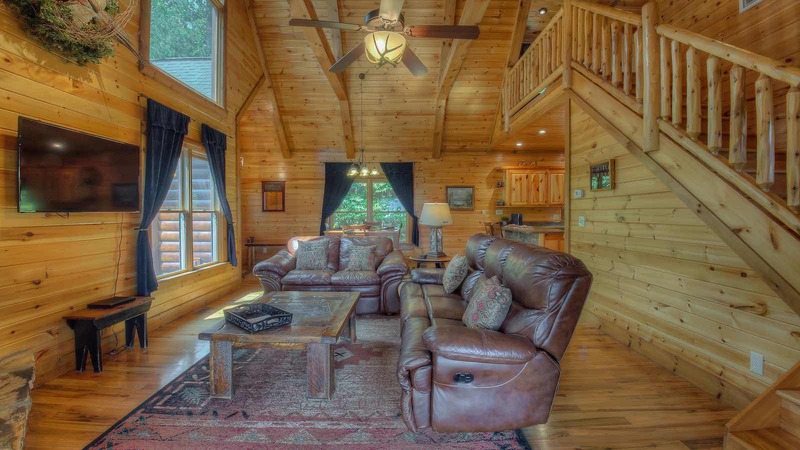 Here you can enjoy lazy evenings of your favorite wine and reminisce on some old memories while making new ones! 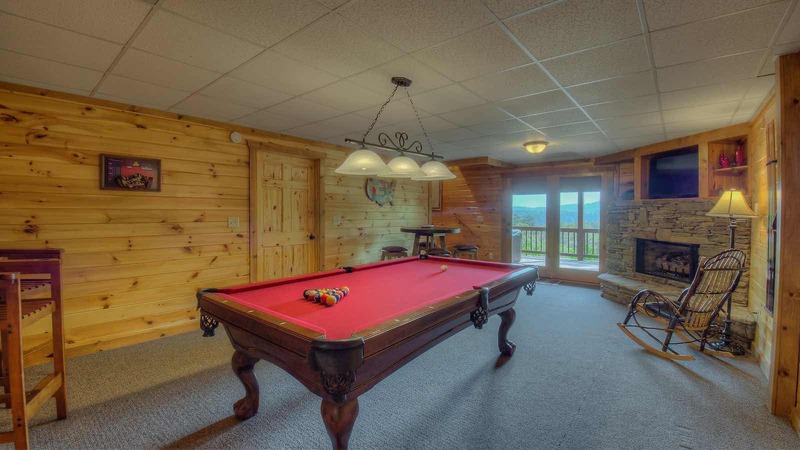 Down to the game room level for a game of pool or a soak in the swirling hot tub! 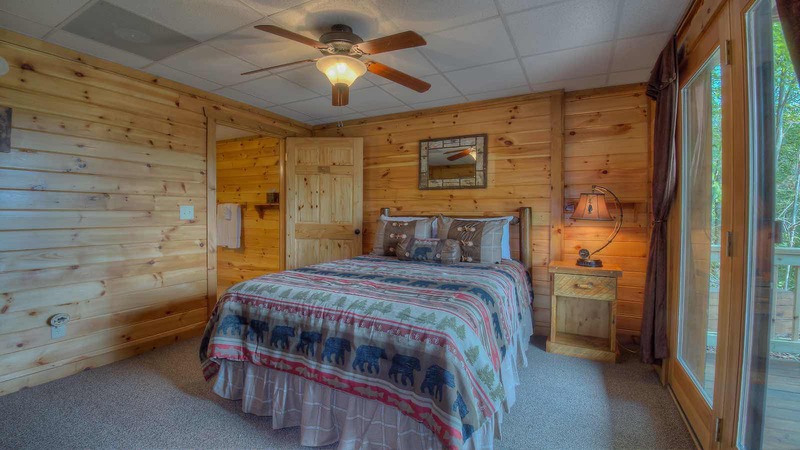 The game room level has the 3rd bedroom, which has a Queen size bed and flat screen TV. 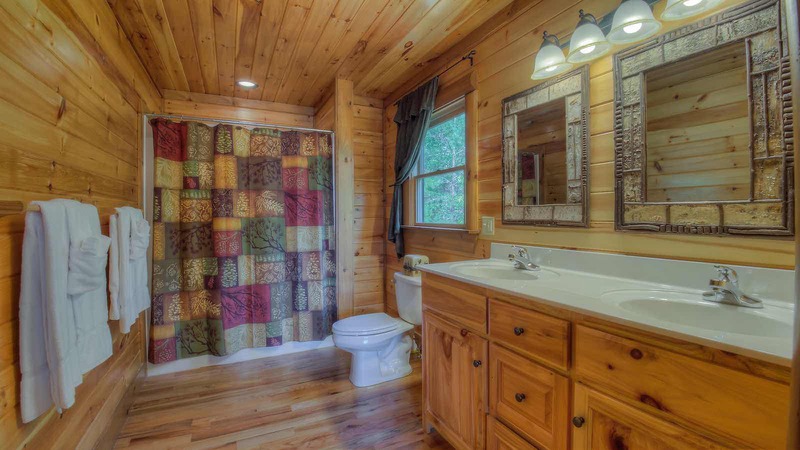 This level also has a standard shower combo with a single vanity. 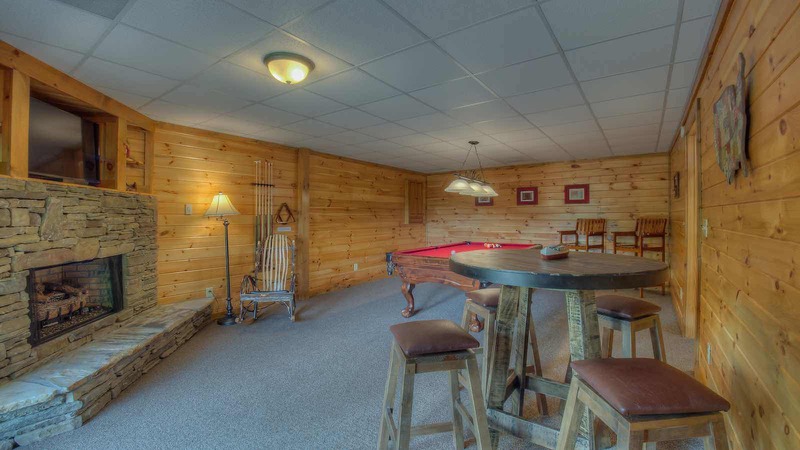 The game room has a flat screen TV atop the stacked stone gas log fireplace, plus the pool table and pub table for all night card games! 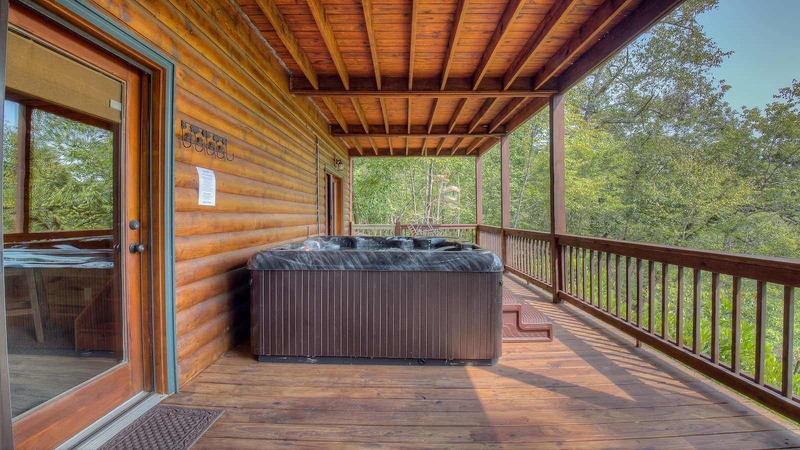 Outside the game room is the paved patio area, that has the hot tub that overlooks the mountains. 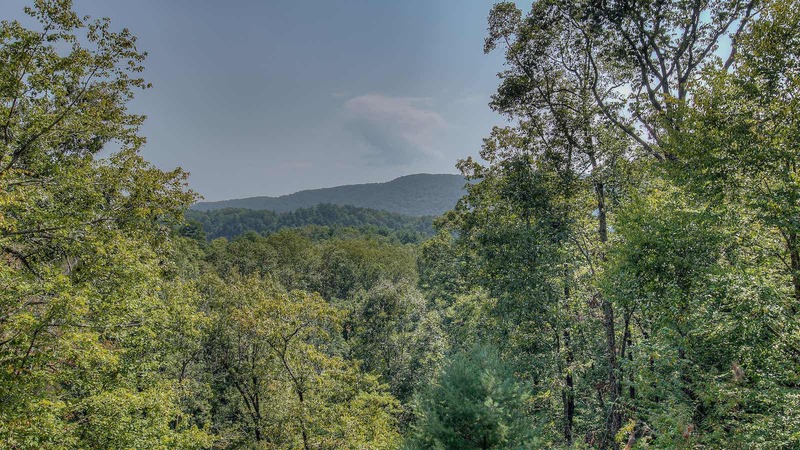 Chasing Dreams is less than 4 miles from Downtown Blue Ridge, so you’ll be a short drive from all the amazing restaurants, shopping, and all the wonderful things Downtown Blue Ridge has to offer. 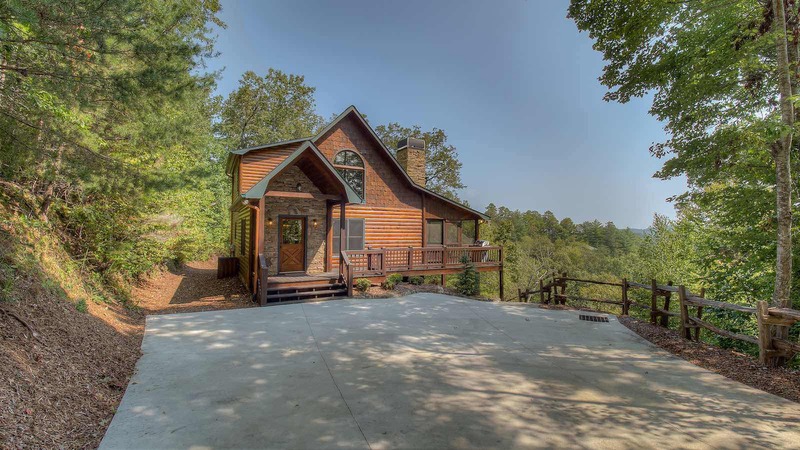 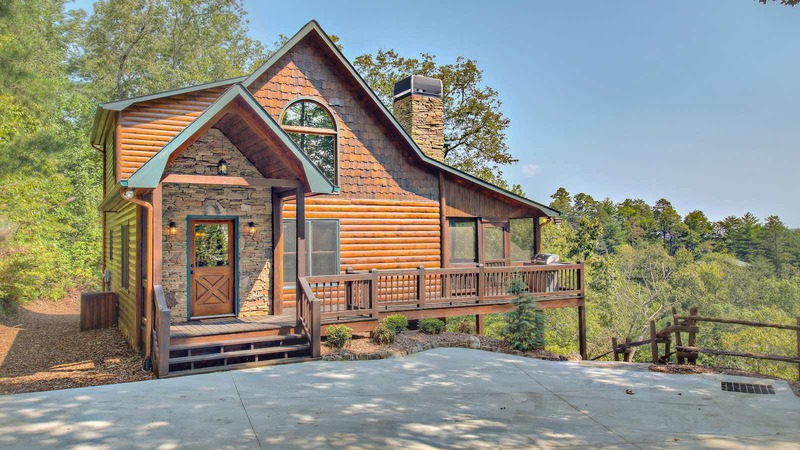 Chasing Dreams is the perfect all paved, easy access mountain view cabin you’ve been looking for!